aus Atlanta, dem tiefen Süden der USA sein. Erstmals, wird sie in Deutschland, mit ihrer Originalband, dass aktuelle Grammy nominierte Album "Debris" vorstellen. Malone die in Amerika mit US Größen wie Sheryl Crow, Lucinda Williams und Bonnie Raitt verglichen wird, spielt exclusiv, nur diese eine Show, auf dem Schöppinger Blues Festival. Michelle Malone has been making hard-edged albums that combine blues, folk, rock, and country music for more than 20 years, but still remains criminally underrated as an artist. With a few exceptions, Debris is a blues-rock outing delivered with her trademark gritty vocals, solid guitar work, and a handpicked band that includes guitarist Peter Stroud (Sheryl Crow), keyboard player Tony Reyes (Gwen Stefani), longtime collaborator Phil Skipper on bass, and Dave Anthony (Butch Walker, Ike) on drums. Nick DiDia (Bruce Springsteen, the Black Crowes, Train) produces with a light hand to keep the sound raw and dirty. “Marked” sounds like a Rolling Stones outtake and likens breaking up to a car crash or drive-by shooting; Malone’s vulnerable vocal underscores the song’s desolate feel. “Feather in a Hurricane” is tougher, with noisy slide guitar complementing Malone’s snarky delivery. “Restraining Order Blues” bounces in on a Bo Diddley beat; Malone recites all the damage she’s done to her ex’s property and possessions with a cynical smirk in her voice and celebrates her acting out, even as she’s cuffed and put into a police car. “Weed and Wine” recalls the happier days of a relationship behind a sadder but wiser beat and a wistful organ that sounds like the whistling of a far off freight train promising rescue and redemption. “Chattahoochee Boogaloo” is a tough bluesy country song about wild girls sneaking out of the bedroom windows on summer nights to explore the mysteries of womanhood, marked by stinging slide guitar and Malone’s crooning vocal. Malone breaks the frame with “14th Street and Mars” an R&B ballad with a ’60s flavor and an outstanding vocal, and “Candle for the Lonely,” a lament delivered with acoustic guitar and subtle melancholy country piano from Reyes. Armed with a bottleneck slide, blues harmonica, and her signature soul-filled vocals, Michelle Malone was born in the Deep South and grew up listening to her mother sing in the church choir every Sunday. When it came time to craft her own sound, she took those religious roots, blended in enough rock, folk, and blues to satisfy. The result is, Debris, a high-spirited stripped down blend of rootsy acoustic slide, gritty electric blues and explosive vocals that harkens back to the lost recordings of Bonnie Raitt, Lucinda Williams and The Rolling Stones. Debris, Michelle’s 10th release, is easily one of her most revealing and emotional discs. Helping her capture the mood is producer Nick Di Dia (Nick has been Brendon O’Brien’s engineer for 15 years, and has worked on recordings by Springsteen, Pearl Jam, Train, Matthew Sweet). Says Malone, “Nick is brilliant, and we found that we work very well together. He was able to translate the live grit of “Feather In A Hurricane” and “Undertow” and in the next breath illustrate his sensitivity and finesse on “14th Street and Mars” and “Debris”. He let the songs take us where they wanted to go. Malone found herself tackling some serious subject matter while at the same time making that spirited soul-shaking music that she loves. She says, “I have to play these songs every night, so I need them to be fun – I want to have a good time, too.” If one line could capture the sentiment of Debris it would be, “Don’t you think it’s time to let your childhood go?” Michelle expounds, “Debris is basically a breakup record about a relationship that had me in a state of arrested development for over a decade. I wrote about the anger, the heartbreak, the humor, and the relief I finally found in the end.” Joining Malone in the studio were long time friend and heavy hitter Peter Stroud on guitar (Sheryl Crow), Phil Skipper on bass (Tinsley Ellis, Drag the River), Tony Reyes on keys (Dallas Austin, Gwen Stefani), and Dave Anthony on drums (Ike, Butch Walker). The names of Michelle Malone’s ten albums serve as an autobiography; New Experience, Relentless, For You Not Them, Redemption Dream, Beneath the Devil Moon, Home Grown, Hello Out There, Stompin’ Ground, and last year’s critically acclaimed Sugarfoot. She has been on dozens of “Best Of” lists and won many awards throughout her career including 4 time best album (Atlanta magazine), 2 time best acoustic guitarist (Creative Loafing, IAC), Best Blues Guitarist (IAC.com), and 5 time female vocalist of the year (Creative Loafing). Living a paraphrased line by one of her inspirations, Tina Turner, Michelle has never done anything nice and easy. She bit the major label lure and despite promises broken, indulgences extended and excesses expected, Michelle continued creating solid songs, introspective, energetic and impressive forays into bluesy rock as well as tasty pop nuggets. This wealth of material has enabled Malone, to tour and record for over 20 years, averaging over 200 days a year on the road. Michelle’s live show is not to be missed—she can make the biggest venues seem as cozy as a campfire, and an intimate venue feel like the center of the universe. 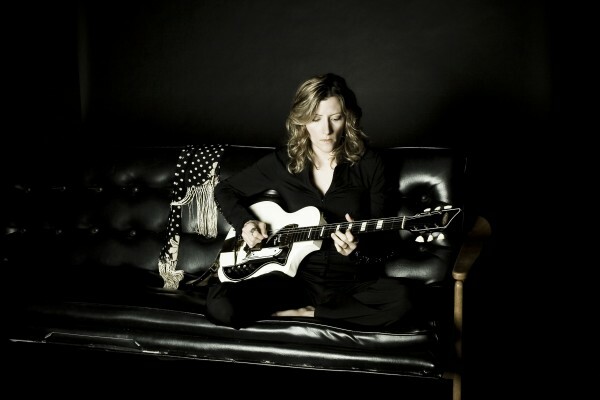 She’s shared stages with blues legends Albert King, Charlie Musselwhite, Johnny Winter, Little Feat, Lurrie Bell, ZZ Top, Robert Cray, Keb Mo, Tinsley Ellis, Marsha Ball and Chris Whitley as well as Indigo Girls, John Mayer, Steve Earle, K.T. Tunstall, Shawn Colvin, Jackson Browne and Joan Osborne.